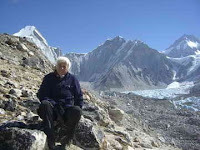 At 9 a.m. May 2nd in a cold and blithering wind although the sun had awaken the white painted peaks surrounding me, we reached our highest destination of this Nepalian quest. 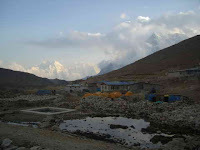 We had arrived at a distance from but in front of the base camp of Mt. Everest, with a clear view of the horrendous but inviting ice fall (every climber must tackle the frozen ice with their crampons, picks and courage when they start out from base camp) and the rare peek at Mt. 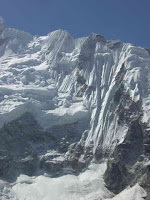 Everest itself, which you cannot see inside base camp. At this moment, we hung the prayer flags from my granddaughter first grade class, the flags made by girls in Reconition Academy, a representation of flags from Calvary Church, and from my friend Louise in Jackson Hole. 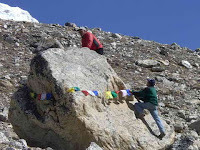 I was absolutely out of breath at this altitude 17,040, which is about base camp level, and sat on a rock and took pictures while Jim and my Sherpa Nima actually climbed up higher to make sure the flags were on a ridge and caught the breeze. They did. The prayers to our God were flying up to Him. It made me a bit teary. And I said a prayer of thanksgiving that this was able to happen. We had set out at 7:30 for the long and grueling trek through every kind of boulder and rock going straight up near Base Camp area. 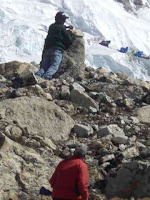 We could not actually step foot in base camp because the government of Tibet and China have put a halt to anyone entering Base Camp who does not have a license to summit. Even the base camp manager who doesn’t summit was kicked out until after the torch passes on the China side. It’s all a nightmare to people who love Everest for the challenge. 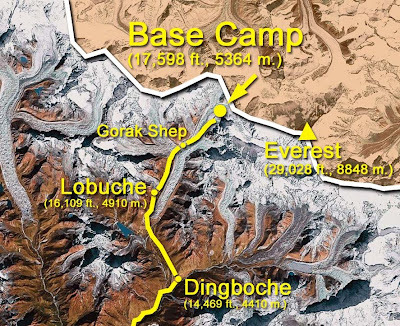 We saw many famous climbers and Sherpas coming back down from Base Camp for a few days of R&R until they will be permitted to launch a summit, supposedly after May 10th. As we were hanging the flags, a military helicopter cruised over us, surveying what was going on. The camp at this moment is under military direction. But we did it,. By golly, we did it. The night before had been a heinous one for me. Gorek Shep is the worst of the worst. The trek up to it, last stop before Base Camp, calls on every single ounce of courage and strength. The paths are dominated by trains of yak, so I got lots of rests clutching a bolder so they could pass. We crossed frozen water falls, and followed the scarey trail on cliff edges which bordered the glacier that goes on forever along the Everest area. When we arrived, there was a single room outside filled with Sherpas playing cards, but that was the only place one could get warm from sunlight coming in through a plastic ceiling. So we sat there, drank lemon tea, and I fell asleep among our equipment on the bench. The only other little bit of heat comes from a dining room fire of yak dung, which when burning smells like a bad cigar. It irritated all of us and we wheezing and sneezing drastically. All of us were feeling the altitude. The reaction I have, beside not sleeping a wink at night, is just plain breathless. I have to stop every so many steps upward. Even though you take a rest (I call them Rock Sit) , it’s like everything has been drained out of you. At Gorek Shep, the lodge was a two-story fire hazard, rooms were so thin you could hear everything going on in your neighbors sleep, and it was icy cold. There was the proverbial hole in the floor toilet which I was afraid to walk down to in the night. I’ve never felt so dirty and unclean in my life, and I am afraid it will continue until we get back down to Pengboche tomorrow night and have a shower in the room. I’ve failed at all other attempts at hot water showers. After we came down from the Base Camp safari, refueled with a Snickers bar and some hot lemon tea, it was time to get out of Gorek Shep. I call the trek for the next six days the Hallalujah Trail, because Hallelujah, we made it so now I don’t have to tackle the rocks and gorges and deep descents and painful ascents ever again. We spent almost three hours getting down from Gorek Shep to Loboche where we were well taken care of at the Lodge. The wind was bitter cold, it cut right through the long underwear and the warm gloves gripping my two sticks. My nose ran the entire time, but, although we only came down about 1000 feet, I was feeling some relief from the altitude. 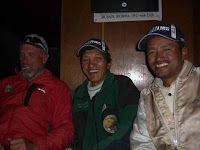 It was cloudy and tedious - miles, it seemed, of rocky flatlands that I stumbled over continually, but I had my two sherpas bodyguards, Nima and Jeta, grasping my arms as I maneuvered a difficult steep downhill where one slip and I’d have slid thousands of feet down. That’s what they refer to exposure in mountain climbing. It kicks in my vertigo. It had taken us four hours to go up from Loboche to Gorek Shep, but it took us only 2 hours and 45 minutes to descend. Although I was completely frozen, the dining room was warm and I chowed down a grilled cheese and tomato sandwich, got the guys to fill up the two hot water bottles which have become my constant companions, and rolled up in heavy heavy blankets this lovely place provides. We kept out a few prayer flags to hang at the highest monastery on this route, that of Geshi Lama in Pangboche. We will do that tomorrow after arrival. He has given approval of that and Nima will select the appropriate place where the wind will carry our prayers to the heavens. Photos: 1. Our highest point at 17,040 with base camp, the ice fall, and some of Everest in background. 2. A typical glacier ice fall. 3. Hanging flags. 4. Hanging my granddaughter's class flags. 5. Loboche from my window. 6. Jim, Nima and Jeta - my heroes who got me there. You are an amazing creature of God, with the strength of a tiger and the patience and endurance of an elephant. Mt. Everest is blessed to have you so close. Safe travels on the rest of your journey.